In late 2008 Adad Hannah received a telephone call from an old friend in British Columbia. Gus Horn, a rancher, community activist, and art collector, wanted to stage a version of Théodore Géricault’s monumental painting The Raft of the Medusa (1818-1819) in 100 Mile House, a community of 2000 people in central BC. Although Hannah initially tried to talk Horn out of pursuing the project, explaining that it would be difficult and expensive, the details for remounting this tragic scene were finally worked out in early 2009 and Hannah flew to BC to get started on the project. In 100 Mile House, the artist met with Horn and made presentations at the local high school, junior high, and community art centre trying to find people interested in being models and volunteering for other roles. Eventually the entire community came together for this project, with volunteers building the set, making costumes, applying makeup, and feeding a cast and crew of well over 40 people. The backdrop was painted by local painter Tom Godin using both brushes, and rollers on heavy canvas. It measures over 1000 square feet and was hung from a three-story scaffold. 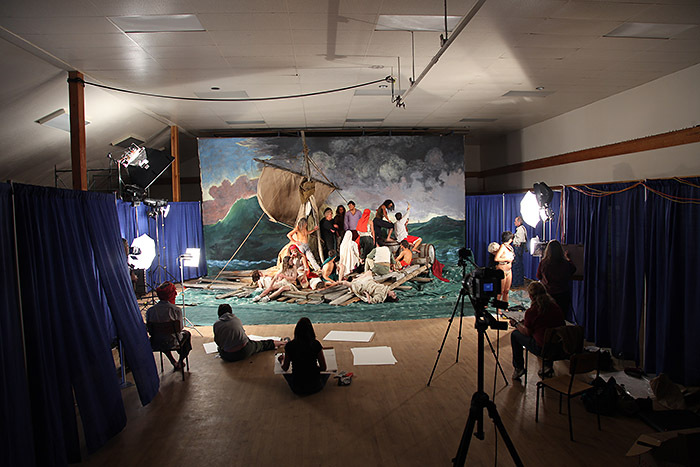 For three months the students met weekly at the high school in order to prepare for the final tableau vivant. They practiced yoga so they would be able to hold the necessary poses, and studied the painting in order to get in the right mood. On May 2nd and 3rd, 2009 in the 100 Mile House community hall the final tableau was performed for several live audiences, a life-drawing class, and Hannah’s video and still cameras. The final cast consisted of twenty students and two itinerant tree planters. The models held their poses for between five and ten minutes, creating an uncanny replica of Géricault’s painting rendered in living flesh. Géricault chose to paint a scene from a recent tragedy, the sinking of the French ship Méduse in 1816, and the plight of the survivors, who, left to their own devices, succumbed to cannibalism, dehydration, and insanity as their numbers shrunk from an initial 150 passengers to the final fifteen who were discovered by accident two weeks later. The finished canvas measured a giant 16’ by 23.5’ and was eventually purchased by the Louvre shortly after the artist’s death in 1824. The community of 100 Mile House has been ravaged itself, if somewhat slower and less dramatically than the passengers of the raft, by downturns in the cattle and forestry industries. 2009, Toronto International Art Fair, Pierre-François Ouellette art contemporain. 2009, The Raft of the Medusa (100 Mile House), Pierre-François Ouellette art contemporain, Montréal.